Our October 2010 hostess, Lori of Lori’s Lipsmacking Goodness, has challenged The Daring Cooks to stuff grape leaves. Lori chose a recipe adapted from The New Book of Middle Eastern Food (a Borzoi Book by Claudia Roden, published by Alfred A. Knopf). 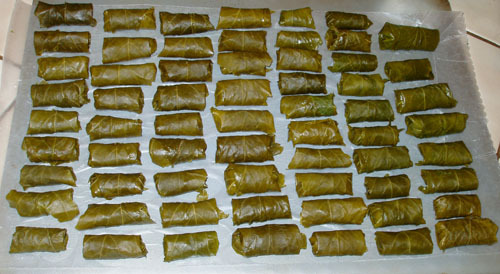 40 – 50 preserved or fresh grape leaves. 1. Pour boiling water over the rice and stir well, then rinse with cold water and let drain. 2. Mix the rice with the chopped tomatoes, onion or scallion, garlic, parsley, mint, cinnamon, allspice, dill, salt and pepper to taste. 3. Place a grape leaf on a flat surface, vein side up. 4. Place about two teaspoons (10 ml) of the filling in the center of the leaf, near the stem edge. 5. Roll the leaf end to end, starting from the stem edge. As you roll, fold the sides of the leaf in toward the center. The leaf should resemble a small cigar, about 2 to 2 1/2 inches (50 mm to 65mm) long. 6. Repeat with the remaining leaves and filling. 7. 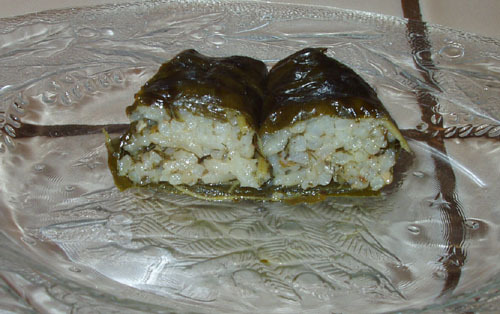 Pack the stuffed leaves tightly in a large pan lined with tomato slices or imperfect grape leaves. The tightness will help prevent the rolls from unraveling. 8. Mix together olive oil, 2/3 cup (160 ml) water, sugar and lemon juice and pour over the stuffed leaves. Put a small heat proof plate on top of the leaves to prevent them from unwinding, cover the pan and simmer very gently for about 1 hour, until the rolls are thoroughly cooked, adding water occasionally, if needed, as the liquid in the pan becomes absorbed. Cool in the pan before turning out. Serve cold. I used the given recipe and somehow ended up making 64 dolmas. I didn’t measure out 2 teaspoons every time, but it looked close enough to me. If you have two cups of filling, you should be able to make 48 dolmas. I found it was best to cook them for an hour if I did my large pan (approximately 30 dolmas), but only 35 for my small pan (an even dozen). Then I let them sit in the pan for 30-40 minutes afterward before serving them warm. I like them warm, but they were still great cold the next day. For use the next day, just leave them in the pan when you put them in the refrigerator. Heat on low for 15-20 minutes or serve cold. I froze uncooked dolmas and cooked them straight from the frozen state with great success.